"I want a space to feel authentic, thoughtfully collected, and representative of your life," says Christina Salway, interior designer extraordinaire and owner of the ethereal Glasshouse Treehouse built by NT&S this winter. We're excited to introduce Christina Salway, Treehouse Masters' new interior designer! Read on for Christina's stories behind the many pieces that make this treehouse feel like home. Christina founded her interior design company, ElevenTwoEleven Design with a commitment to offering attainable, affordable design for folks from all walks of life. Headquartered in busy Brooklyn, New York, Christina, her husband, John, and son, Julian head upstate to their Catskills countryside property as often as possible. It was there that Christina, Pete, and the Nelson Treehouse crew decided to build the Glasshouse Treehouse, using salvaged windows to frame unobstructed views of the land. Christina describes the windows in this treehouse as a "patchwork quilt" of collected, gifted, and found pieces. Christina has collected salvaged windows for many years for a variety of projects, including a greenhouse on her previous property. She finds some of these windows on street corners and in shops; others, like the two stained glass windows in this treehouse, have been given to her by her husband and other family members. The aesthetic of salvaged, vintage windows resonates deeply with Christina; she loves the old, chipped wooden frames, and the wavy texture of the blown glass. Using windows for the treehouse walls guaranteed sweeping, unobstructed views of the countryside and ensured that those inside would feel intimately connected with the surrounding nature. Christina and her son, Julian were especially ecstatic about the McIntire Brass Slide Pole installed off the deck of her treehouse. According to Christina, "McIntire Brass has been a family-run company for multiple generations, producing high-quality, low-maintenance brass poles from their location in Somerville, Massachusetts. For more than seven decades, people have relied on McIntire slide poles in fire and rescue stations, dormitories, and other buildings where people need to navigate to a lower floor safely and quickly. Thousands of McIntire slide poles are in use worldwide. When we found out that we could incorporate one of their beautiful slide poles into our treehouse in the Catskills, we couldn't resist! Needless to say, our four year old son Julian is completely in love with his new slide pole!" Watch Christina test out the slide pole in the video, below! How gorgeous are those patchwork walls of salvaged windows!? Christina's choice of a Custom Carolina hanging day bed perfectly complements the playful yet elegant aesthetic of the treehouse. The vibrant rug came from kilim.com. Christina notes that while online rug shopping can be hit or miss, she was blow away by the beauty and quality of this rug. The pendant light came from a vintage store, but you can find a similar style at Rejuvenation. Christina found the rustic desk in a barn at a local farm; the farmer offered to sell it and drive it back to her place for $100! The vintage desk chair was a Craigslist find. 1. Persevere! Check postings frequently (we're talking on a daily basis) to find the best items early. Some days you might not see a thing worth your time; other days, Craigslist will look like a magician hand-curated your dream home goods store. Stay updated on postings to catch these prime moments. 2. Use specific AND broad search terms. If you have something particular in mind, try searching for exactly that item first. But if that initial search fails to produce happy results, be open to trying a much broader search. Using umbrella terms like "brass" or "sofa" will often lead to surprising gems. 3. Think like a thesaurus and use synonyms! Just because you call a couch a couch does not mean that all Craigslist users do. Use a variety of similar words to search for the object you desire. For instance, separately searching "brass," "gold," and "metal" will likely return unique results, and may lead you to that amazing brass monkey figurine you've been hunting for. Christina says that working on treehouses encourages her to be even more mindful of space - the small area requires her to be extremely thoughtful in selecting items. In both treehouses and groundhouses, Christina focuses on balance, ensuring that function, furniture, and breathing space are all given room to shine. If you can believe it, this display case was yet another Craigslist find! Made of salvaged windows, it looks perfectly at home inside this glasshouse treehouse. Christina's son, Julian, loves all things creepy crawly, from amphibians to reptiles to dinosaurs. Christina thought this display case would be a fun way to bring some critters into the space for Julian to admire. Christina encourages others to approach design with a personal touch; in her own words, a home should not look "like a model from Crate and Barrel." You can make a space reflect you and your story by integrating things that are truly dear to you, and by taking time to thoughtfully curate your collection of important home items. Combining old and new pieces also helps create a unique space. Christina and John look forward to hosting many friends on their treehouse deck to watch the sun set over the Catskills. 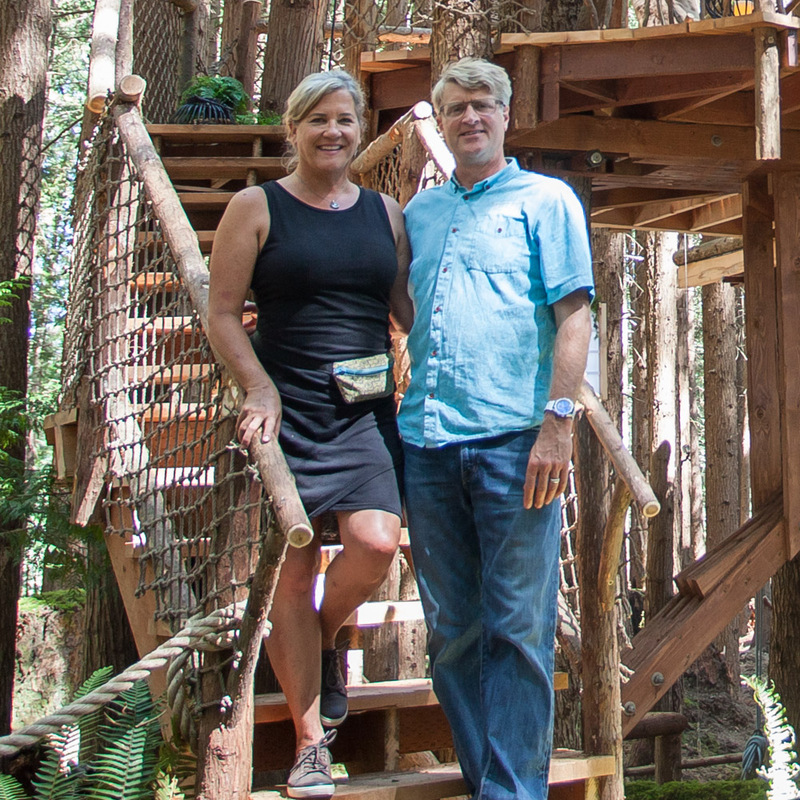 More than anything, Christina loves how the treehouse enables her family to interact with the land in a new way. Experiencing the property from above is a powerful experience; the treehouse provides spectacular vantage points to soak in the surrounding fields, forests, and mountains. After swinging in the five-person hammock below the treehouse, Christina's son, Julian declared it was, "the best day ever!" Christina found the filament bulb string lights at Lights.com. Pete and the crew are excited that Christina will officially be joining the Treehouse Master's team as the new interior designer! We are inspired by her approach to small space interior design, and look forward to watching her grow into her new role and illuminate interiors of many treehouses to come! Working with Tory Jones for these past years has been a true pleasure and privilege, and we wish her the best in all her endeavors. We hope you've enjoyed taking a behind-the-scenes look at Christina's Glasshouse Treehouse! Catch the next all-new episode of Treehouse Masters on Animal Planet next Friday, January 27. To stay updated on behind-the-scenes tours of treehouses, subscribe to our mailing list and follow us on social media.